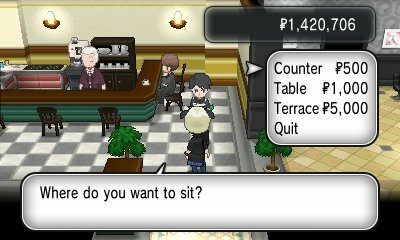 In the Kalos region, there are numerous cafés within certain towns for you to enter. When you go in them, the wait asks you where you want to sit, the bar, a table or the terrace and will offer you a drink. This drink will heal your Pokémon. However, there's a certain aspect to the cafés which is overlooked. When you have been escorted to the part of the café selected, you will be able to walk around and talk to the people there. Each one will talk about a various Pokémon, and the Pokémon they talk about changes in each day. 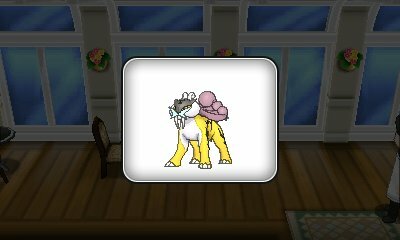 When they talk about the Pokémon, they show it to you, and add it to your Pokédex. If you select Terrace as your place of dining, you have a higher chance of seeing Pokémon that have not been seen in your Pokédex, including legendary Pokémon.